Authors: PAIVA, W. O. de; WEIGEL, P.; SILVA FILHO, D. F. da; MACHADO, F. M.
Authors: BULLOCK, T. H.; DOMNING, D. P.; BEST, R. C.
Authors: HEILIGENBERG, W.; BASTIAN, J. 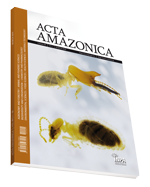 Authors: FALCÃO, M. de A.; LLERAS, E.; KERR, W. E.
Authors: LEITE, A. M. C.; RANKIN, J. M.
Authors: ROCHA, A. I. da; LUZ, A. I.; RODRIGUES, W. A. Authors: PESSOTTI, I.; LÉ’SÉNÉCHAL, A. M.
Authors: ROCHA, A. I. da; LUZ, A. I.; MARX, F.
Authors: AMOROSO, M. Christina de M.
Testes preliminares para o controle da podridão negra da popunha Bactris gasipaes ALVES, M.L.B. ; FLORES, W.B.C., vol. 12-3. Studies on the floral biology of Neotropical Nymphaeaceae. 3 PRANCE, Ghillean T.; ANDERSON, Anthony B., vol. 6-2. Bottlenecks in the migration routes of Amazonian manatees and the threat of hydroelectric dams Eduardo Moraes ARRAUT, José Luis ARRAUT, Miriam MARMONTEL, José Eduardo MANTOVANI, Evlyn Márcia Leão de Moraes NOVO, vol. 47-1. The Relationship between Stem Vessel Parameters and the Development of Strata in the Early Stages of Secondary Forest Succession in Amazonia TSUCHIYA, Akio; HIRABUKI, Yoshihiko; NISHIZAWA, Toshie; LISBOA, Pedro B.; SILVA, Carlos R., vol. 32-2. Avaliação de defeitos no processo de fabricação de lamelas para pisos de madeira engenheirados com uso de ferramentas de controle de qualidade Jaqueline COLETTI, Ghislaine Miranda BONDUELLE, Setsuo IWAKIRI, vol. 40-1.